In Nevada, a conveyance is defined as every instrument in writing, except a last will and testament, by which an estate or interest in lands is created, alienated, assigned or surrendered (NRS 111.010). 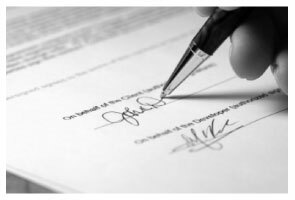 A real estate deed must be signed by the person of lawful age from whom the estate or interest is intended to pass or by that person’s lawful agent or attorney, and acknowledged or proved, and recorded (NRS 111.105). A customary form for a conveyance in this state is a grant deed, which is available in the Nevada Forms section. Quitclaim deeds are also used frequently in real estate transactions in Nevada. The authority to convey real property or interest in property in this state is given to any resident citizen, person, or domestic corporation of lawful age. Further, any non-resident alien, person, or corporation may take, hold, and enjoy any real property or any interest in lands, tenements, or hereditaments within the state of Nevada as fully, freely, and upon the same terms and conditions as any resident citizen, person, or domestic corporation (NRS 111.055). Additionally, any person claiming title to any real property may, notwithstanding there may be adverse possession thereof, sell and convey his or her interest therein in the same manner and with the same effect as if the person was in actual possession of the property (NRS 111.165). Title to real property may be owned in several different ways, including, but not limited to: by individuals, those claiming jointly, or by corporations. The way in which title to real property is held will determine the owner’s rights and method of conveyance. Every conveyance in writing by which real property is conveyed or may be affected must be acknowledged or proved and certified in the manner provided in Chapter 111 of the Nevada Revised Statutes. The proof or acknowledgement of a conveyance affecting real property, if acknowledged or proved within this state, must be taken by one of the following: a judge or clerk of court having a seal, a notary public, or a justice of the peace (NRS 111.265). A certificate of the acknowledgment of any conveyance or the proof of the execution thereof, signed by the person taking the acknowledgment or proof, and under the seal or stamp of that person, if that person is required to have a seal and stamp, will entitle the conveyance, with the certificate, to be recorded in the office of a county recorder in Nevada. The proof of the execution of a conveyance in this state can be by the testimony of a subscribing witness, or when all subscribing witnesses are dead or cannot be had, by evidence of the handwriting of the party, and of at least one subscribing witness, given by a credible witness to each signature (NRS 111.115). Formatting requirements, as well as pertinent information to include, also apply to the recordation of a real estate deed. Visit the Nevada Recording section to view the complete guidelines. The recording act in Nevada does not make recording mandatory, but it does provide valuable incentives for doing so. Every conveyance of real property, and every instrument of writing setting forth an agreement to convey any real property, or whereby any real property may be affected, that has been acknowledged and certified shall be recorded in the office of the county recorder in the county where the property is located in order for the instrument to operate as notice to third persons. If an instrument is not recorded, it will be valid and binding only between the parties to the instrument (NRS 111.315). Every conveyance or instrument of writing that has been acknowledged or proved, certified, and recorded, must from the time of filing with the recorder, impart notice to all persons of the contents; and subsequent purchasers and mortgagees shall be deemed to purchase and take with notice (NRS 111.320). Every conveyance of real property in Nevada which is not recorded as provided is void against any subsequent purchaser in good faith and for a valuable consideration, of the same real property, or any portion thereof, if his or her conveyance is first duly recorded (NRS 111.325).